Sometimes what we need are drawers. Sometimes all we have are shelves and hanging rods for our clothes. Aside from demolishing a space and building drawers or buying a dresser, there are a couple ways to create the effect of drawers without them. But not every space will fit such an item. Walls tend to get in the way. And, small items could get lost in something this size. 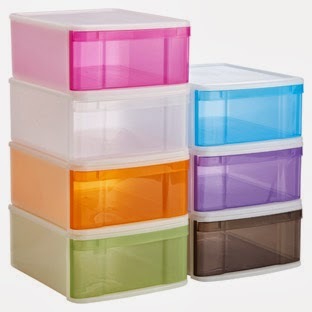 True, many sizes, colors and materials available in similar products. However, creativity comes in handy, too! In this closet, we needed to store a lady's undergarments - tops and bottoms. This was our only place to store her clothes, with no option for a dresser drawer elsewhere. Because I try not to purchase new items for my clients, we sorted through emptied and unused organizing products from elsewhere in the house. Fortunately, we found a couple baskets that could fit her collection well. The challenge was to make them move like drawers. 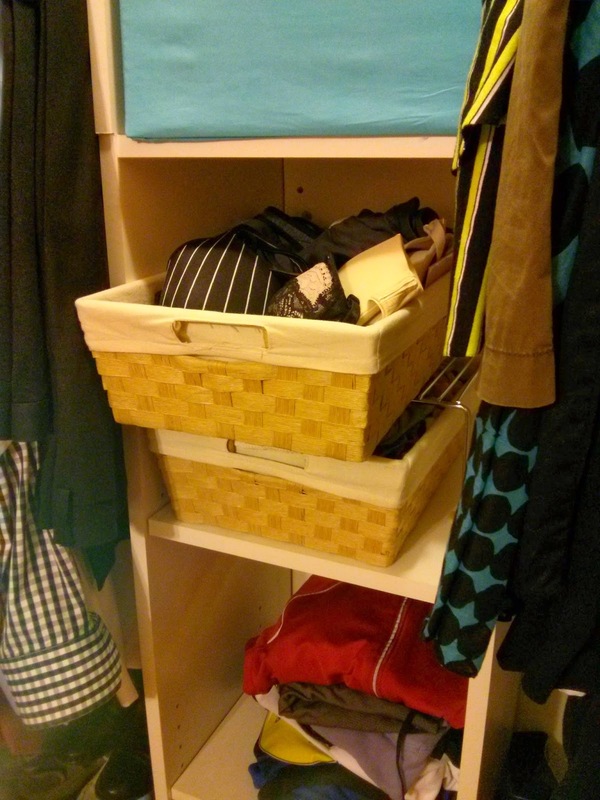 Under a bathroom sink, we located an unused cupboard shelf that fit into the closet! Eureka! We could now place one basket under the shelf, one above, creating another level. Because of the smooth surface of the shelf, the metal cabinet shelf and the smooth baskets, they could slide back and forth to get at the items more easily. Hooray! Who needs real drawers, anyway?